Be part of the stories we share with our nursing community. 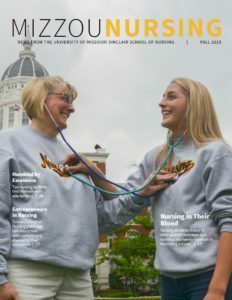 Contact the Mizzou Nursing Magazine today to share yours. Our recently released, campus-wide strategic plan titled, “University for Missouri: The Flagship of the Future,” lays out a bold strategic vision to re-energize our statewide commitment. As a new dean, I am thrilled to be part of a futuristic transition forward. The Sinclair School of Nursing has a strong legacy with which to transform, innovate, collaborate and forge ahead. 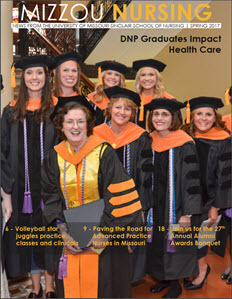 We build upon many notable accomplishments such as receipt of the largest federal grant in Mizzou’s history, holding first place in research funding among peer AAU, land-grant, public nursing programs, NIH funded T32 to support PhD students and exceptionally strong BSN students who hold the highest GPA of all undergraduate majors on campus. Our strong and proud foundation will launch our momentum into the future. 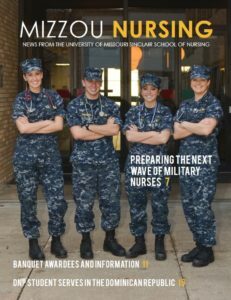 As you read this copy of Mizzou Nursing, there are numerous transitions. We say goodbye to Toni Sullivan, dean and professor emerita, who passed away June 25. We say goodbye to Vicki Conn, associate dean for research, who retired Sept. 1. 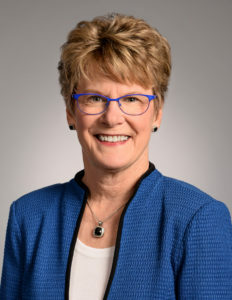 Vicki will be long remembered as a dedicated and humble leader, who paved the way for nursing research while serving as mentor, administrator and journal editor. We say hello to new faculty, administrators and opportunities.